The fire at Eastern Market two years ago was a horrifying event. It took from us one of DC’s best places. Renovations at the Eastern Market building are almost complete and a re-opening date has been set for June 26th. Vendors will start to move back into the beautiful brick South Hall on June 14th getting ready for the Friday opening on the 26th. WASHINGTON, DC – Mayor Adrian M. Fenty announced today that the District will reopen the historic Eastern Market at a ribbon-cutting ceremony on Friday June 26 followed by a community celebration on Saturday June 27. 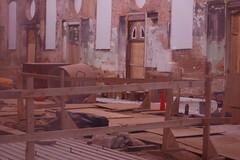 The two events will mark the completion of the market’s renovation and recovery from fire damage caused in April 2007.